In Word, they are in the Paragraph section of the Home ribbon. These icons, unlike the Paragraph dialog settings, only affect the entire list. They do not make adjustments to individual items. Each of the paragraph settings work on individual list items, so the user can make changes that give an individual item a different indentation and spacing than the others at the same level. This adds to the settings in the Bullets and Number dialog, which adjusts every item at a particular level. Paragraph settings allow you to make one of the items at a particular level different than the others. After creating a list, click the desired point that you want to change so the cursor is flashing in it. Now you can use paragraph styles. Paragraph settings can be found in the Paragraph dialog. They also can be found in the formatting toolbar and the Properties tab of the sidebar. The sidebar has the same settings as the dialog and toolbar. First the items in the toolbar will be covered. Then the article will present the sidebar and dialog items that are not in the toolbar. These are the icons at the right side of the Formatting toolbar for editing paragraphs. These two icons increase and decrease the space. They add or reduce space above and below the bullet or number item at the same time. The above and below spacing will be equal. Each click will add or reduce the space b .04 inches per click. These icons are also in the Properties tab of the sidebar. These icons increase or decrease the bullet or number point by .49 inches per click in a heading or a traditional paragraph. However, for a bullet or number list item, clicking one of these icons will promote or demote the item a level. This is like the Promote One Level and Demote One Level icons in the Bullets and Numbering toolbar. The Paragraph dialog has text boxes for indenting and putting space above and below paragraphs. The other tools for indentation and adding spaces give you more control over how the bullet and number points are adjusted. They are text boxes with up and down arrow buttons, and they are in the Properties tab of the sidebar and the Indents & Spacing tab of the Paragraph dialog. There are five text boxes that are divided into two sections: Indent and Spacing. The Properties tab in the sidebar has the same paragraph settings as the Paragraph dialog and Formatting toolbar. This section contains three text boxes. The section is in both the Properties sidebar and Indents & Spacing tab of the Paragraph dialog. The First line text box affects the item the same way as Before Text Indent. If it is moved to the right, only the number or bullet point will be moved initially. Then the text on the first line will move. However, if the text for the point has multiple lines, the subsequent lines will move with the number or bullet point. If it is move to the left, the bullet or number will be moved. The text on the first line will remain in place. Subsequent lines will be moved with the number or bullet point. You can type the desired indentation in the text box. Negative numbers can be entered. The up and down arrows can be used to adjust the indentation. Each click changes the number by .02 inches per click. This will indent the line to the left. Number or bullet points will not be moved. New lines will be created as the indentation is moved to the left. If the indentation is moved farther to the right, text is moved to the right. The number of lines may also be reduced. This is a setting that LibreOffice has over Microsoft Word because space can be added above and below individual points. Microsoft Word only allows you to place space above a list or below a list. It will not allow you to put space above or below individual points. For Writer, place you cursor in the bullet or number item that you want to add space above or below. There are several options for adding spacing. These text boxes are found in the Spacing section of the Properties tab in the sidebar and the Indents & Spacing tab of the Paragraph dialog. After the cursor is placed in the desired point, open the Paragraph dialog to the Indents & Spacing, or click the Properties tab in the sidebar. The text boxes can be adjusted by either typing the desired inches in the box or clicking the up and down arrow buttons. Clicking the up and down arrow buttons adjusts the space by .02 inches per click. The Line Spacing drop-down menu in the toolbar, dialog, and sidebar affects the line height of an item. This can act like one of the spacing text boxes. 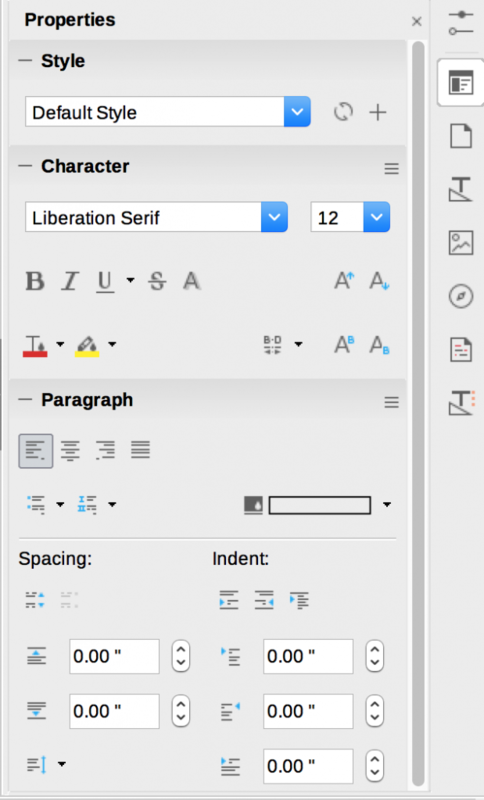 Like Writer, Word has a paragraph dialog that allows the user to indent an individual point to the left and to the right. It also allows you to add space above or below the selected numbered or bulleted item. The Home ribbon also has several paragraph settings. They are different from the ones in the Paragraph dialog. The Paragraph section in the Home ribbon has several settings for adjusting paragraphs. It also gives you access to the Paragraph dialog. These are covered in the next two sections. In the Paragraph section, there is an item that allows you to access the Paragraph dialog. Like in Writer, these icons will increase or decrease non-list paragraphs by .49 inches per click. However, it does not indent list items. Rather it moves them up or down a level. If Item A and Item B are both at level one, you click Increase Indent when the cursor is in item Item B. It now becomes a sub-point of Item A. This drop-down menu has Add Space Before Paragraph and Add Space After Paragraph. It also gives you access to the Paragraph dialog. These items affect an entire list, not individual items in the list. The Add Space Before Paragraph only works if the cursor is in the first item in the list. Add Space After Paragraph only works if the cursor is in the last item in the list. Each one adds 12 pt before or after the list. This item does not allow you to increase the spacing more than 12 pt. Once you click it the item, it is replaced with Remove Space Before Paragraph or Remove Space After Paragraph. To adjust individual bullet and number points, you need to access the Indents and Spacing tab in the Paragraph dialog. This can be accessed by clicking Line Spacing Options item in Line and Paragraph Spacing drop-down menu. The dialog also can be opened by right-clicking on the list to view the context menu. Click the Paragraph item from the list. The Paragraph dialog in Word 2016 paragraph settings do different things to paragraphs than those in the Home ribbon. As mentioned earlier in the article, the dialog is similar to the Writer one. It has items to indent and add space to individual list items. Click the Line and Paragraph Spacing icon to reveal the drop-down menu. Click the Line Spacing Options item. It also can be accessed through the context menu that appears when you right-click on a list item. Right click on the item you want to adjust. Click the Paragraph item in the menu that appears. The dialog has an Indentation section and Spacing section. The text boxes in the Indentation section are measured in inches. The boxes in the paragraph section are in points. This section has Left and Right text boxes and a drop-down menu for the first line. The Left text box will indent the bullet or number and its associated text to the right at the measurement you enter in the text box. You can type the desired measurement in the box, or click the up and down arrow buttons. Each click will adjust the indentation by .1 inches. The Right text box indents the text in the line to the left. Text may be moved to a new line. It is adjusted the same way as the Left text box. The Special drop-down has three options: Hanging, First line, and None. Hanging indents the first line farther than the subsequent lines. First line indents the subsequent lines farther than the first line. None makes the farther left characters of subsequent lines even with the number or bullet. There is a By text box associated with the Special drop-down menu. Like the right and left text boxes, type the amount of indentation. Clicking the up and down arrow buttons changes the measurement by .1 inches per click. This section has Before and After text boxes that add space before or after a selected point in a list. The measurement is in points. Type the measurement in one of the text boxes. Or click the up and down arrow buttons. Each click changes the measurement by 6 pt per click. There is also a drop-down menu that changes the height of a line. The associated At text box allows you to set measurements for several of the choices in the text box. Line height is not covered in this article. 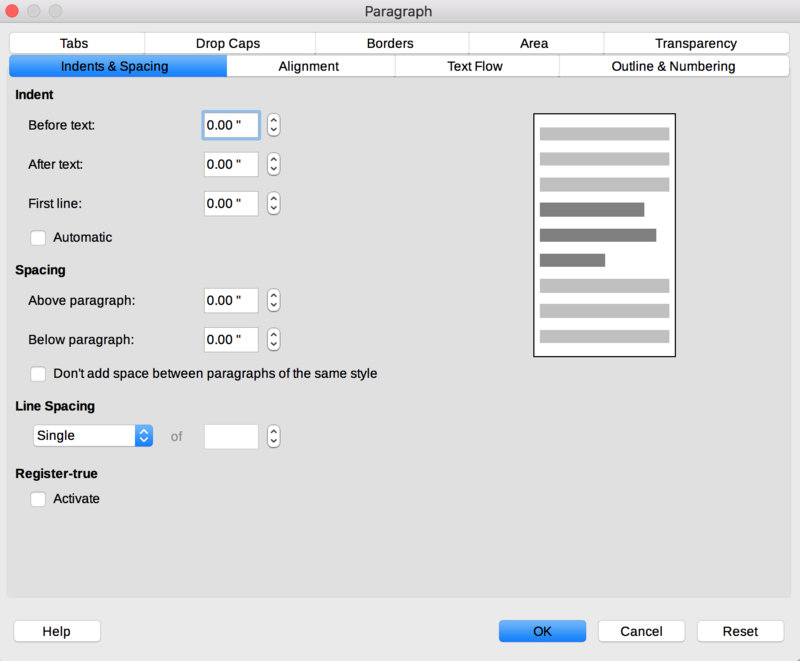 Word and Writer have the basically the same settings for adjusting the indentation and spacing of a list item. The Decrease and Increase Spacing icons that are in Writer’s Formatting toolbar and sidebar are the key advantage because they affect individual items in a list. The user also can click them multiple times. 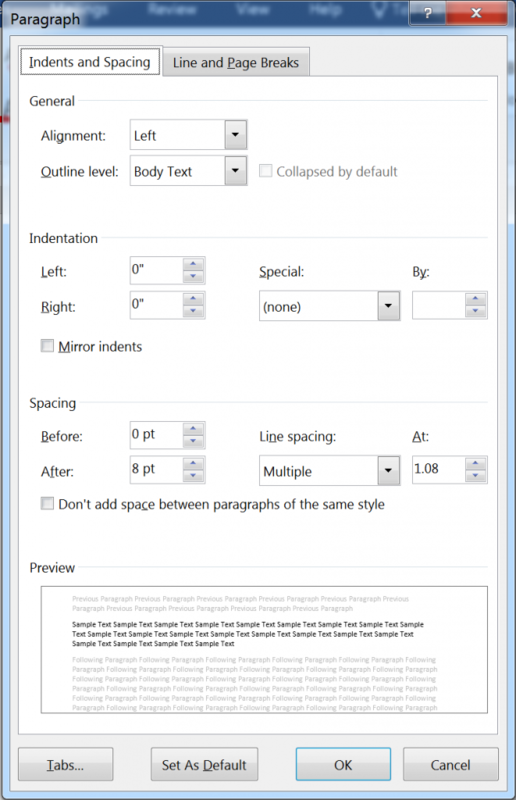 Word can only adjust individual items through the Paragraph dialog. This does not allow for the user to see the changes until the OK button in the dialog is clicked. Writer’s dialog works the same way, but the same settings are in the sidebar. This allows item adjustments to be seen as they are made. The Left and Right indentation text boxes are Word’s advantage because the are an addition to the settings in the Multilevel list dialog. They move the number or bullet and its text as one. In Writer, the number or bullet is moved, followed by its associated text. It affects only one list item, rather than every item at a particular level. It, however, does not have a setting that moves a number or a bullet and its associated text as a unit, like Word does. These strengths and weaknesses make another argument for using both applications to edit a document. Writer can be used to create space above or below a list item. Word can be used to indent an item. LibreOffice’s developers have done a good job at creating a competitive office suite to the world’s most popular one.